Like so many thing in the world today, I would like to blame this one on Pinterest! All those shiny food pictures and new recipes with glowing descriptions are dangerous! I saw a post for peanut butter soup. I really love peanut butter. It’s almost a food group in my house, and thus turning it into soup sounded awesome! I won’t bore you with the recipe, but it was very little beyond peanut butter, vegan butter, and some almond milk. It tasted like oil! Blech! It seems a shame to ruin good peanut butter! Solar cooking wasn’t a total loss though. 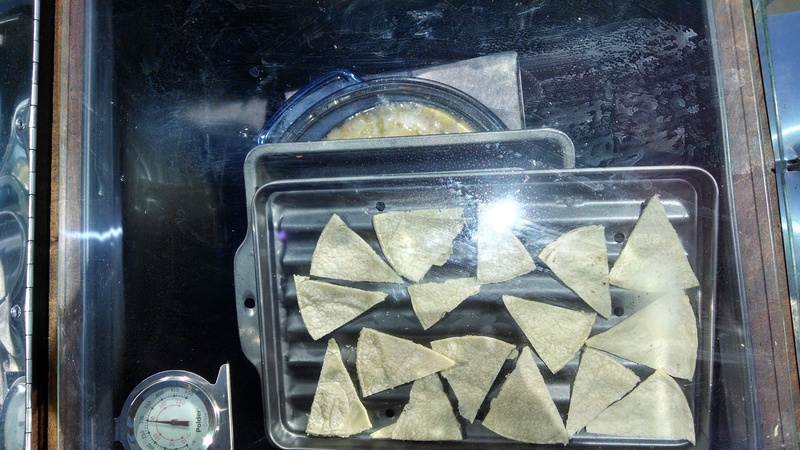 I cut some tortillas into wedges and baked them to be chips for lunch. They turned out to be reasonably tasty with a pinchc of salt. I’m so glad you can stack things in the solar cooker, otherwise we’d be missing out! Here is my Sun Oven all stacked for lunch.